Trevor Paglen’s surveillance states, on at Prefix Institute of Contemporary Art, is an uncanny visual exploration into the surveillance state. Visually and metaphorically Paglen both turns his lens toward the surveillant and appropriates the conventions of surveillance imagery. The installation is comprised of four series of images and two video installations which seek to make seen both the technologies that are instrumental in the surveillance of the contemporary world and the ways in which they see. 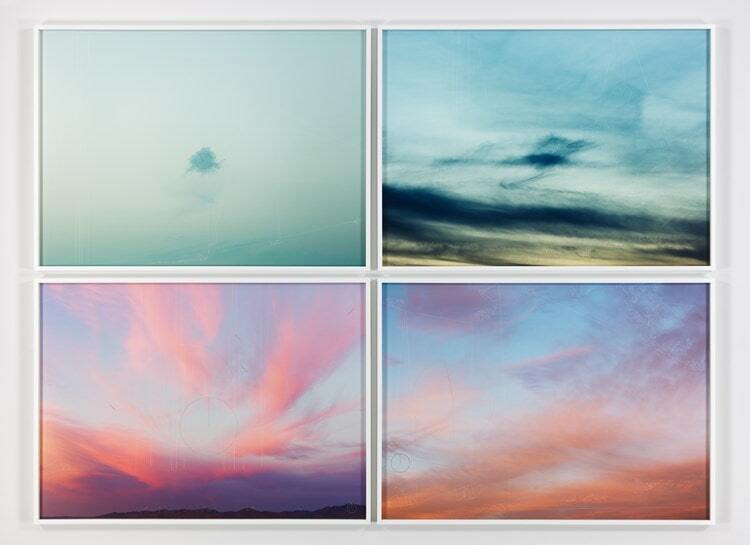 The first of these series is entitled “Four Clouds (2017).” A set of four images of clouds in varying tonalities and colour schemes, the images “depict the sky as seen by four different algorithms used for object recognition, guided missiles, autonomous surveillance systems, and three-dimensional modelling.” Geometric shapes and symbols are overlaid onto the otherwise tranquil scenes juxtaposing artifice with nature and inviting the viewer to see as a machine does. In doing so Paglen makes an implicit commentary on the nature of the contemporary world as an omniscient and omnipresent surveillance state. By juxtaposing the natural realm with the vision of the technological, he implies a sense of claustrophobia, even in the vastness of the sky; the sense that one cannot escape being watched in the contemporary surveillance state, not even the clouds. Mapping a virtual cartography of undecipherable information over the scene, he shows us a familiar vista and yet makes it feel completely foreign. The second of these series is “Untitled (Reaper Drone) (2013).” The image much like “Four Clouds” depicts a vast cirrus cloud dimly lit by the diffuse light of dusk. 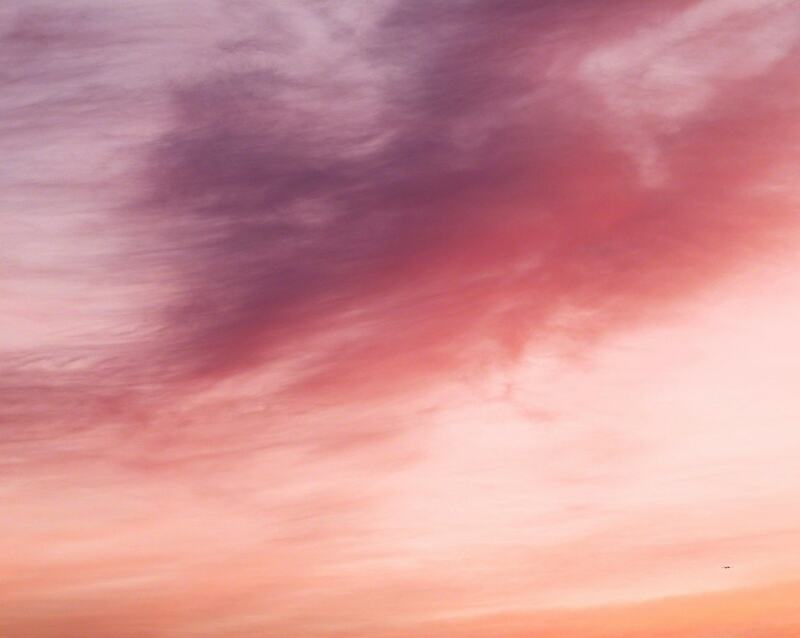 Without the context of the other images in the exhibit, one would think this is merely a landscape photo, depicting the natural beauty of the sky’s ever-changing gradients in the early hours of the evening. However, if one looks closely they will find a small speck in the photo which becomes the protagonist of the visual narrative. 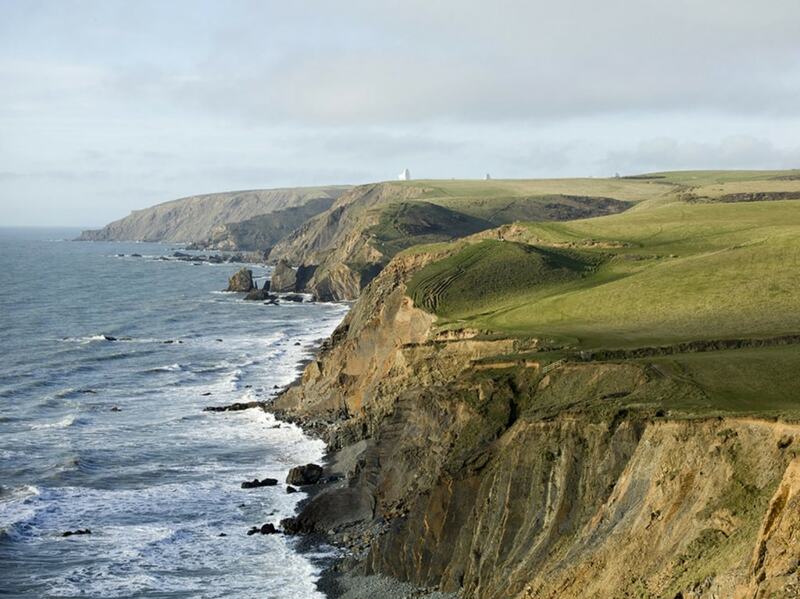 The speck is a small drone flying amongst the vast expanse of the vista in the background, another instance in which Paglen depicts the apposition of nature vs. artifice. The implicit commentary of the imagery suggests a juxtaposition of the grandeur of the natural world in relation to the size of surveillance technology. In framing the image as a landscape photo one finds themselves uneasy upon realizing the drone is present, again eliciting the sensation of being watched; a feeling that even in the great vastness of the natural world, that surveillance technology exists lurking in the shadows. The image in a way exists as a voyeuristic complement to Paglens “Four Clouds (2017).” If “Four Clouds” depicts the way in which a machine surveilles its surroundings, then “Untitled (Reaper Drone) (2013)” invites the viewer to surveille the surveillant. The third of the series in the exhibit is titled “Near Nogales (2017)”. The image depicts the “border between Mexico and the United States as seen through the computer-vision algorithms that continually monitor the border.” Much like the two previous series, “Near Nogales” from a distance appears to be a landscape photo, offering a breathtaking view of the rolling hills of the Mexican border accented by a salmon-hued sunset replete with wispy clouds streaked throughout. Upon closer inspection, a cartographic array of red and green shapes overlay the image, superimposing the generative visual language of surveillance technology. The narrative and motifs of the exhibit as a whole become more obvious here as the progression of imagery continues. The supposition of innocence and familiarity from a distance is replaced by a feeling of unease and paranoia as the viewer comes to terms with the hybridization and contamination of the image as a visualization of surveillance methods. The gaze of the viewer immediately shifts from admirer to surveillant, no longer enjoying the scenery but scrutinizing it as we inherit the mentality of the watcher. Paglen imbues innocent scenes as being contaminated with some sort of threat by the act of framing them within the context of surveillance. The fourth series of images titled “Colombia Florida Subsea Fiber Undersea Cable Atlantic Ocean (2015)” is a different approach altogether. 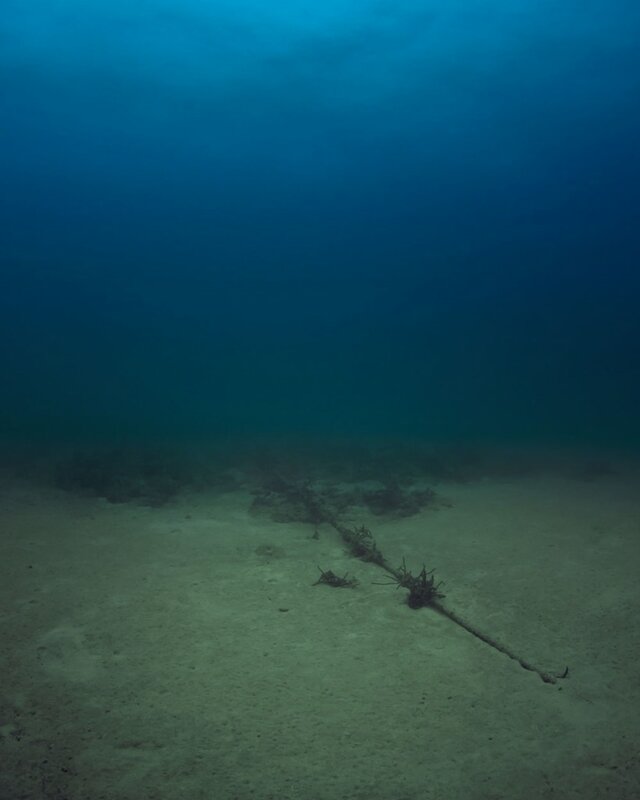 Paglen this time travels to the depths of the ocean to photograph the internet cables that run along the ocean floor. The photos, resolutely banal and mundane in appearance offer a peculiar insight into the physical manifestation of the virtual world. Through these seemingly insignificant tubes run billions of gigabytes of data. Here, we surveille the entire internet in a single banal visual, offering an insight into the precariousness of our data. When one views the images it reveals a salient reflexive moment of our own paranoia, the realization that we are no more immune to being watched than the rolling hills of the Mexican border in “Near Nogales” or the unassuming sunsets of any given evening in “Four Clouds”. Lastly, the exhibit includes two video installations which anchor and reinforce the motifs of the exhibit as whole; that of adopting the perspective of the surveillant, that of the omniscient and omnipresent surveillance state, and that of the juxtaposition between nature and technology. In the first of the two, titled “89 Landscapes (2015)”, a series of 89 locations is filmed at first at a distance as a part of a seemingly aesthetic visualization of the terrain. 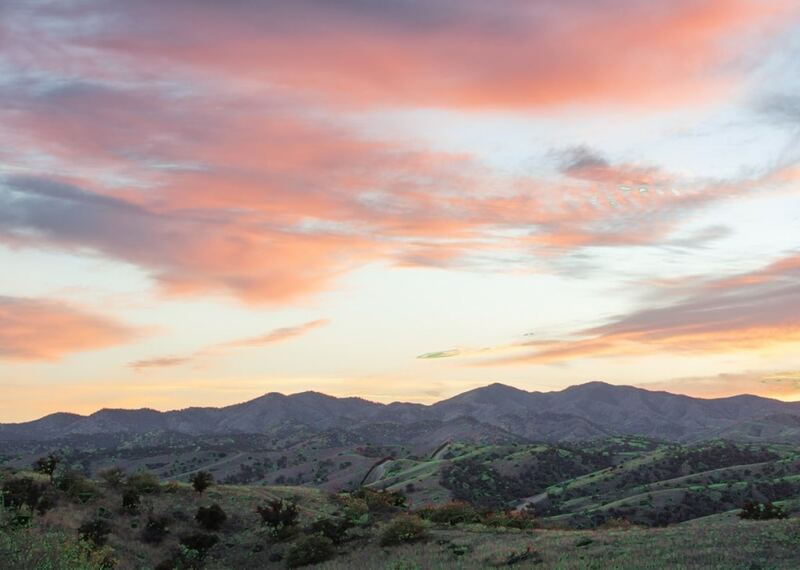 The rolling hills of a pasture, or a desert landscape, at first seem unassuming and placid; areas of nature perfectly preserved and documented by Paglen’s lens. The soundscape echoes the tranquil nature of the scene offering an ambient auditory component which lulls the viewer into a false sense of calm. However, Paglen’s gaze intensifies, offering jarring cuts which zoom abruptly into the landscape, accompanied by the now discordant soundscape swelling in volume and intensity. The scene specifies as the cuts zoom closer and closer, revealing surveillance technology looming ominously in the distance, the cold-hard truth which echoes throughout the entire exhibit sets in for the viewer; we are always being watched. At the height of the drama the intensely zoomed frame combined with the explosive disjunctive soundscape come to a crescendo; invoking a sense of terror in the viewer. At an instant the scene cuts, the soundscape abruptly ends, and the calm innocence of another landscape interrupts the drama, only to have the cycle repeat itself again. Paglen inverts the relationship between the watcher and the watched by turning his lens toward surveillance technology. The otherwise relative banality of such imagery is infected with a sense of terror in Paglen’s framing and filmic convention in order to subconsciously instil the viewer with an apprehension and fear toward the surveillance state. The last of the series in the exhibit “Circles (2015) is a single-channel video installation directed by Laura Poitras and for which Paglen served as a cinematographer. 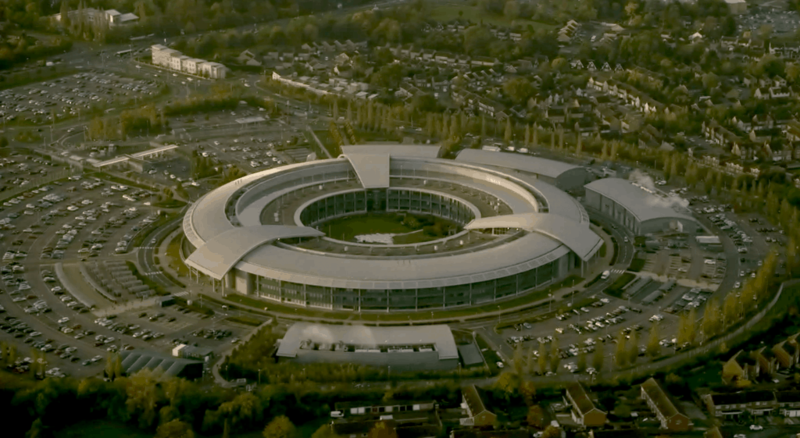 Circles depicts the Government Communication Headquarters (GCHQ), a cryptography and intelligence agency located in southwest England, the largest facility of its kind outside of the United States.” The film consists of a continuous aerial shot of the headquarters from a helicopter accompanied by a soundscape of ambient noise from the helicopter including radio transmission from the cockpit muffled by the deafening whirr of the propellers. The film effectively appropriates the conventions of surveillance technology and modes of seeing by mimicking a scene the audience is familiar with, the television newscast aerial shot. By appropriating a familiar mode of seeing, the scene is immediately imbued with the audiences pre-existing bias of what one should expect. Intense aerial zooms, muffled radio transmissions, the sound of helicopter wings droning in the background, these are all subconscious auditory and visual cues of the voyeurism of crime occuring. As in “Near Nagoles” the audience immediately adopts the gaze of the watcher, no longer enjoying the film as an aesthetic experience but as a surveillant with a sense of urgency and imminent danger. Paglen once again inverts the traditional relationship between the watcher and the watched by turning the audience gaze toward the very hub of surveillance technology that watches them. The exhibit’s repetitive motifs of adopting the perspective of the surveillant, visualizing the omniscient and omnipresent surveillance state, and juxtaposing nature and technology serve as a reclamation of sorts against the perpetual panopticon in which we find ourselves. By flipping the power dynamics of which we are forced to submit and highlighting some realities of the contemporary Surveillance State in which we live the audience is forced to adopt new perspectives on their perceived freedom.